Pixie is an excellent garden apple for those who like traditional English apple flavours. 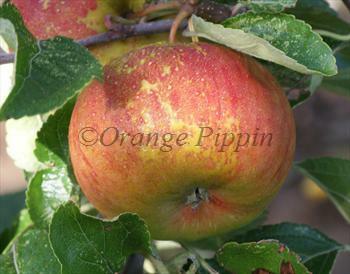 It is a good substitute variety for Cox's Orange Pippin (its probable parent) but much easier to grow. The flavour has some of the aromatic qualities of Cox's Orange Pippin but is more robust - a good choice if you prefer a slightly sharper apple. Red Pixie is a sport of the original variety, identical in flavour and growth characteristics, but with a more pronounced red colouring. Please fill in the details below and we will let you know when Pixie apple trees are back in stock. Pixie is in flowering group 4. Pixie is self-sterile and needs to be pollinated by another tree of a different variety nearby. Pixie is easy to grow and generally untroubled by diseases. The apples tend to be quite small and Pixie has a tendency to over-crop, so it is a good idea to thin the fruitlets in June. Pixie was developed at the National Fruit Trials at Wisley in Surrey, in 1947. It is thought to be a seedling of Cox's Orange Pippin.